We left Honfleur when the electricity was turned off and made our way onwards to somewhere we hoped we would find electricity. We ended up slightly inland at Neufchatel-en-Bray where there was another paid aire with barriered entry just outside a campsite. I can see why campsites might do this, it’s a way of continuing income over the winter months without the need to be fully staffed. The aire was situated on a cycle path which gave easy access into the town and would also allow you to get as far as Dieppe if you had the energy. It was too cold for us to consider cycling that far, plus Paul still doesn’t have a working bike. So this was going to be a food based visit. 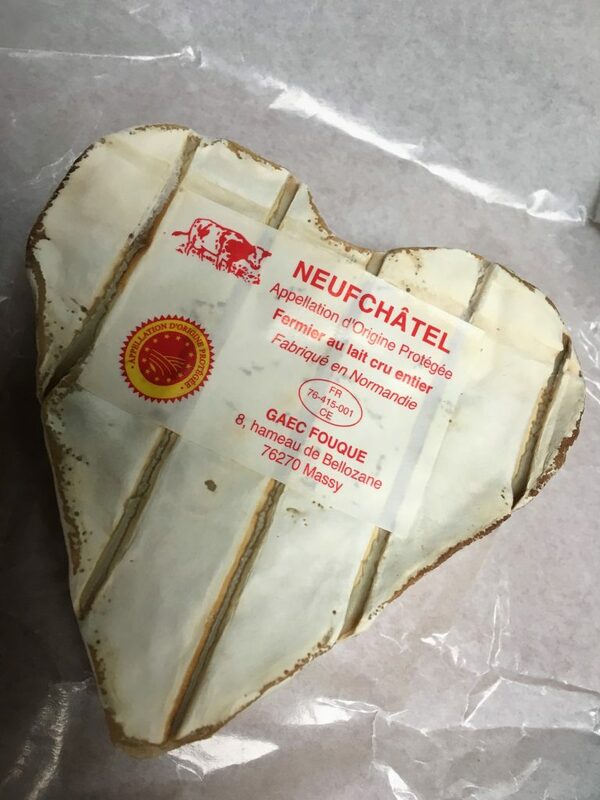 Neufchatel is famous for it’s cheese, thought to be one of the oldest of the white rind style cheeses (think camembert and brie) and always presented in a heart shape. So on the Saturday morning we went in search of cheese. We weren’t sure where the local market was, so headed for the Notre Dame church where there were a number of market stalls of the ‘big knickers and shapeless jeans’ variety. Our hearts sank and we wandered further up the road in search of something a bit more food oriented. We didn’t have to go far (although we were waylaid by patisserie), to find some more market stalls around the ‘Halle au Fromage’ – this was more like it, home grown veg, including squashes of all colours and shapes, Christmas geese waiting for collection with their necks still feathered and their heads peeking out from under their bodies, cakes and of course cheese. When we ventured into the Hall of Cheese it was a dairy heaven, many small producers each with their own version of the Neufchatel cheese as well as other dairy produce, cream, butter and other cheese varieties. Succumbing to the psychology of queuing we decided that the stall with the biggest queue must be selling the best cheese, but then we felt that we must be doing the other producers a disservice and had to go to one of the quiet stalls too. We didn’t eat the cheese there and then (we had patisserie to eat instead), but waited until Christmas, I can report that the cheese from the more popular stall was my favourite with three layers, a heart of crumbly sharp cheese that melds into a more creamy layer and then the outer velvety white rind. The other one was far more creamy and still nice, but not as distinctive, tasting like a camembert. You might think we’d had enough of food, but we spent the afternoon resting and hiding from the cold in Bertie. 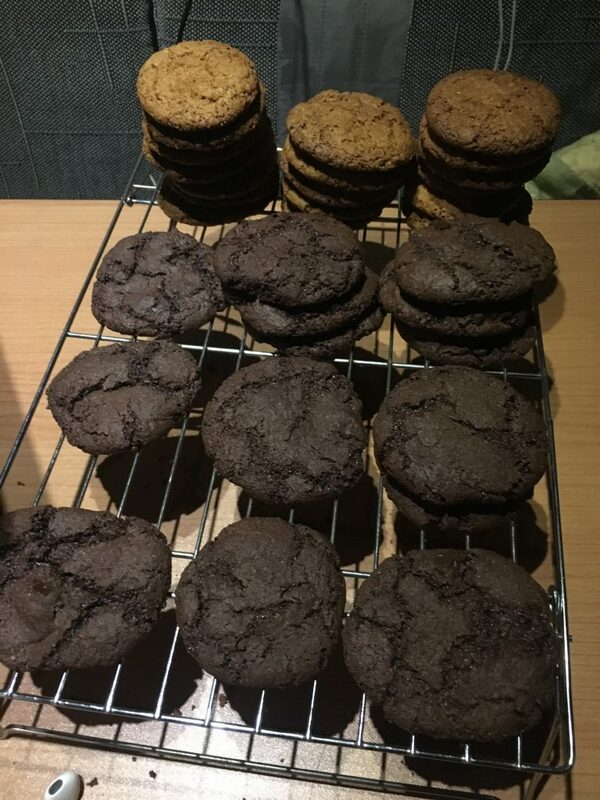 My twitchy fingers needed to do something so I made a selection of biscuits – Ginger and Choc Chip – enough for a game of draughts.